Great Value for money, nice feel and tone. A fan favourite for a decade. he Fender Squier Classic Vibe series has been a huge success since its introduction in 2008. With period accurate guitars being hugely popular for players, Fender wanted to bring this level of appeal to their budget line. Their answer has since become a massively popular model in their lineup. The term “Vibe” is really important in this range. Fender intended not to produce exact replicas of the era, rather guitars that evoked the “vibe” of that time. Where some premium period guitars might go to extreme lengths to produce a guitar that to most would be impossible to tell apart from an original (such as some of Gibson’s Les Paul artist models), the Fender Squier Classic Vibe range instead presents a feel or a vibe from that era. Whatever the approach, the general reputation that has been achieved is that the Squier Classic Vibe range offers sensational value and is often the go to option for guitarists who want a budget option, but not entry level quality. 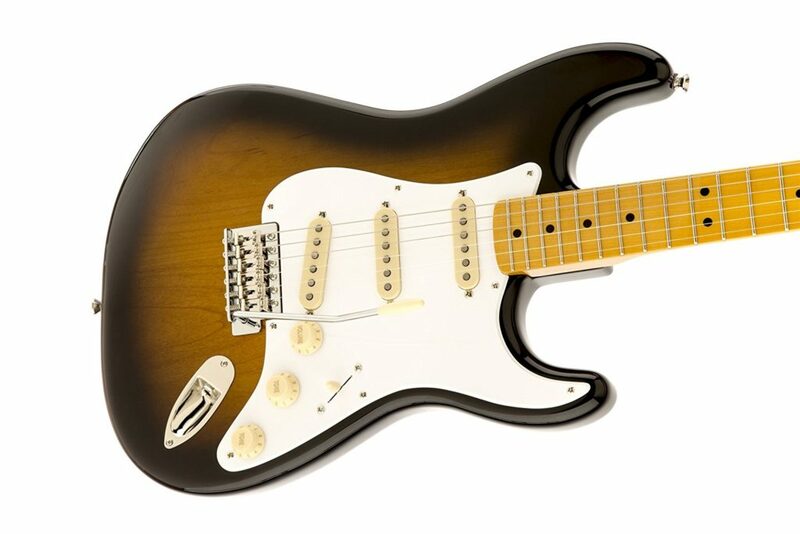 Our test model is a beautiful 2 tone sunburst Stratocaster, with a maple fretboard. To be honest, this is probably my favourite strat in terms of visual appeal. The Maple has a lovely tone, which matches beautifully with the sunburst and aged white tone controls and pickup surrounds. Rosewood would also look great in this guitar, and there are multiple variants available, so you will be able to find a look that suits your taste. As far as feel goes, the neck has a comfortable feel, pretty typical in strats 50’s guitars. It has a gloss finish, which some like, and is typical on a guitar in this price range. For those who don’t like a polyester finish on their neck, you can consider lightly sanding the neck, just to provide a slightly more natural and less sticky feel. Once again, this is a personal preference, and some people would never consider a “hack” of this type for an instrument. So, let’s get serious…how does it sound? Like a Strat? You betcha. With 3 Custom Vintage-Style Single-Coil Strat pickups, and a 5 way switch, you’ll be finding all the great Strat tones that have graced our ears over the last 6 decades. The alder body and maple neck combine to deliver a classically versatile and dynamic range of tones. In lay terms, this means it sounds great and has a ton of different voices. Having now played a few different models in the Fender Squier Classic Vibe range, I will say that I’ve found some minor differences in the tone options between the different variants, which is to be expected. Though I’ll add that the variance is pretty low, so you can expect a similar sound from most models. 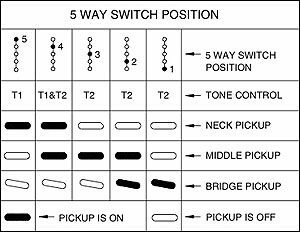 The diagram on the right shows the switch selection in a little more detail. With the combination of switch options, tone and volume controls – there are few tones that these guitars can’t produce. Of course, this is one of the reasons that the Stratocaster became famous. There isn’t much point in a guitar sounding great if it’s no fun to play. This is probably the strength of the Classic Vibe range. 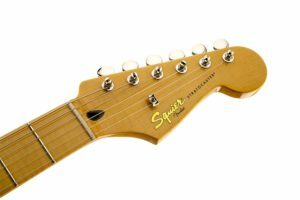 It’s a common occurrence that guitarists trying out entry level guitars might try a few, then pick up a Fender Squier Classic Vibe guitar and immediately notice the difference. For the minor increase in budget, the improvement in quality is noticeable, even to absolute beginners. Much of a guitar’s playability comes down to setup. So bear that in mind that if the model you try has been beaten around a bit, or is fresh out of the box and hasn’t been adjusted. However, you’re more likely to find, like I did, that it will play well from the word go. I typically prefer a faster (thinner) neck, but there is nothing not to like about the general feel of the neck on this Classic Vibe strat. Combine that with the maple fretboard and typically easy access to higher frets & you soon start nodding and smiling as you play. I didn’t need to do any adjusting, but even if I did, tuning pegs, string adjustment and even truss rod tinkering are easy. Some people reading this review may be asking whether it is worth paying the extra cash for a Classic Vibe model? Especially when compared to an entry level models, such as an Affinity Strat. As most of us know, there is a law of diminishing returns when it comes to guitars (as with many purchases). So the more you spend, doesn’t necessarily make it worth it. That being said, when purchasing in the lower end of the budget spectrum, going a few steps up in price can make a big difference. The difference may not be immediately noticeable at first. However, as your skills develop, you’ll come to appreciate the better quality components and maybe even the resale value. If you can spare the additional dollars to get a Classic Vibe, you won’t regret spending. So yes, in this case, it is worth the extra cash. 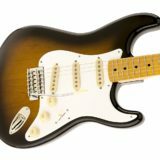 The Fender Squier Classic Vibe 50’s Stratocaster is a serious option for beginner guitarists who want more than entry level build quality, tone and playability. Similarly, guitarists who want a back up or second guitar for practice or jamming will love the value in the Classic Vibe series. It’s clear to see why shop attendants worldwide regularly recommend this model to buyers and Guitar Verdict definitely agrees that if you have the money, you won’t be disappointed.